Not only is this one of the most interesting approaches to interviewing in Bigfoot history, but it is truly an informative interview. 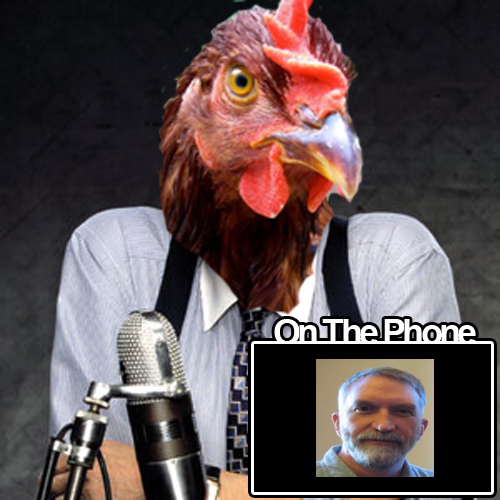 The Chicken of Truth is able to get best out of Dr. Jeff Meldrum. We got the heads up from Damian Bravo, member of Team Tazer Bigfoot, lthe video would be up this morning. Below is how the Chicken of Truth was able to snag the exclusive interview followed by the interview. Yes you heard it right my hairless primate friends my grandpa Dr. Meldrum and I Cot the chicken had a nice early morning conversation about all kinds of stuff. The good doctor explains and talks about the DNA studies and other subjects. Yes and exclusive from the greatest chicken bigfoot researcher in the Bigfoot world, well besides my human grandpa Dr. meldrum with all his science stuff, I had fun talking to him, COT HAS SPOKEN! BUAWWWWWK! In fact, Chicken of Truth first appeared on the video channel of Snow Walker Prime a/k/a Michael Merchant. Below is 30 seconds introducing the Chicken of Truth (COT) ninja training program when he was a mere graduate. Good show Guy. Love the Chicken of Truth. Dr. Meldrum was cool before, but now he is the man, what a show of humility and humbleness to do this interview, he sounds like he was having so much fun and its hilarious but at the same time very informative on the Doctors part in the Sykes DNA study and also his different opions on human are primates and the conerversation about baby bigfoot prints, very interesting stuff. Also great questions by the handsome Cot a chicken to recon with, wish much success Cot. Good interviewer very professional. His name should be Cot Brokaw, or Cottie Chung. Dr.Meldrum makes a good point when he mentions further research will be needed if they do turn up unknown specie. The DNA won't be the end all proof that some think. It will be very important in establishing credibility to the cause which inturn may inspire big time funding to the scientist and legitmate researchers. He also is on the same page as Guy when he talked about just how close their DNA may be to ours because, yes, we too are apes. As far as baby Saquatch prints I think there are many reasons have been authenticated. Some believe that the Mothers carry the young like Gorilla mothers, some believe baby Saquatchs are tree dwellers, and some just overlooked like Dr.Meldrum says. I know if I was near a lake or river or even a hiking trail I would find a size 11 foot print that odd. Corrections, I ment "not authenticated" and "wouldnt find size 11 footprints odd"
C'MON PEOPLE, MICHAEL MERCHANT IS A BUFOON AND SHOULD NEVER BE GIVEN 5 SECONDS OF "ANYONES" TIME.. THIS GUY IS A DISGRACE TO THE ENTIRE BIGFOOT FIELD!! SORRY GUY BUT THATS JUST MY OPINION AND HOW I FEEL ABOUT THE GUY..
Would like to have been able to make it through this interview, but the chicken ruins the entire thing. Idiotic... way to make a mockery of the entire bigfoot subject and researchers. Anons at 4:47 and 5:10 you guys need to get a sense of humor, I can tell you two are those serious researchers that do not contribute anythng to the Bigfoot community. Yet Dr. Meldrum seems to have sense of humor, you can tell the character of a person by the way they are able to laugh at themselvs. here is a link of a interesting article about having a sense of humor and how good it is for your sanity, since both of you need some help in that department. I hope you two anons get a sense of humor quickly. to try to raise some fun to work on finding Bigfoot?? ?